1. How did Medicom Toy come about? We started by getting together a group of people who were passionate about their interests and wanted to make things. I don’t think we’ve ever really thought about what the market was demanding or missing. 2. How many toys does the company produce? We release around 800-1,000 products annually. 3. Why toys? Before I founded Medicom Toy I worked at a computer company. I happened to come across a store selling American toys and I was charmed. About a year later, I entered the toy industry. 4. What sort of toys did you like as a kid? 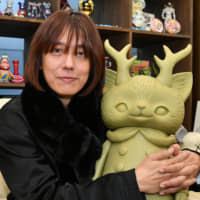 I liked toys by Bullmark (a kaijū monster toy producer). Since starting Medicom Toy, I’ve had several chances to work with that company. It’s an incredible honor to work with a company that gave me so much joy in my youth. 5. Of your early figurine releases, which are you most proud of? Our first toys for “Lupin III.” We contacted (license holders) NTV Music about making toys … they must have thought we were crazy. The idea of an independent toymaker doing this sort of collectable character merchandising for “Lupin III” started with us. 6. What’s it like to produce toys for the American pop artist Kaws? The first market that really accepted Kaws’ work was Asia. 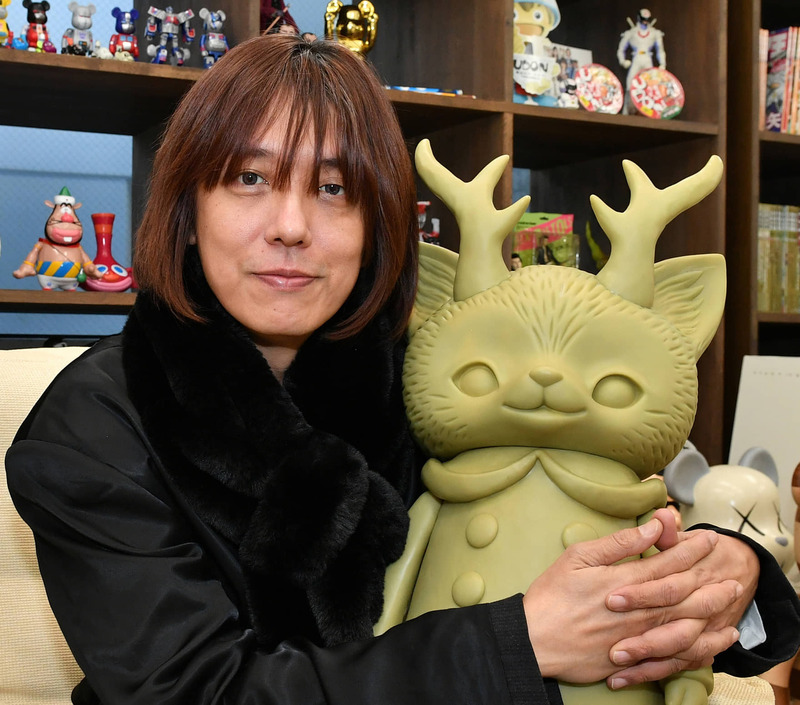 Around 20 years ago he held an exhibition at Shibuya Parco, and nobody in the U.S. knew him. Now his work is on display at MoMA, and our toys are sold there. It’s been great to see his career progress. 7. Do you think the internet has changed people’s hobbies? Everyone’s interests are subdivided (into niches). If you don’t know anyone who’s interested in your hobby, you can go on Facebook or Twitter or Instagram and look for people who share those interests and make friends. 8. How do you approach artists? Direct contact. In the past we emailed them; now we reach out through Instagram or Twitter. 9. Is there a right time in their careers to approach them? Getting from zero to one is up to the artist. If they can get to one, we can help them get to 10, but we can’t help someone get from zero to one. 10. What is your aim with artist collaborations? We want to take what they want to accomplish or express and amplify it. 11. Are there any differences between working with Japanese and American artists? Not really. If we see something special in their work and where they want to go, we’ll work with them. 12. Which of your toys are particularly popular? Different regions are enthusiastic about certain artists. For example our Jean-Michel Basquiat Be@rbrick sold really well in America, while Keith Haring’s did very well in Asia. But we don’t really chase after specific trends. 13. Is it challenging to promote Japanese toys overseas? Five years ago I served as an adviser for Cool Japan, to help them understand how to promote Japanese products overseas. What I came to understand was that anything you create — wine, meat, whatever — if people in Japan don’t like it, why would people overseas want to buy it? 14. What’s changed at Medicom Toy over the years? We’ve become more international — we have people from France, Hong Kong and South Korea. When I ask them why they wanted the job, they tell me that they’ve always loved Medicom Toy and aspired to join the company, and that’s a great feeling. 15. Do you have a personal favorite Medicom Toy item? That’s like choosing which kid is your favorite — they’re all cute. But the one I put the most time into is probably Be@rbrick. 16. How did Be@rbrick come about? We got a lot of sales promotion-related offers for Kubrick, another toy. But they wanted tens of thousands of toys in months. We wanted something that we didn’t need new parts for and could just change (the art). I think of Be@rbrick as a canvas. 17. Has toy-making lost its artisanal quality to the digital era? Until 20 years ago people said the same thing about the design industry. I think toy-making is similar. The difference between digital and handmade products is disappearing. 18. Then is digital design the future of toy making? (Now) you still need to manufacture (soft vinyl) toys by hand. But if we could change the process with 3D printing and scanning technology, and make it possible for anyone to create (a design), there would be more toys on the market, more creative designs. 19. Won’t that make things tougher? To survive as a company, it’s all about making toys that are more interesting than the ones we made yesterday. Our rivals aren’t other toy makers, it’s all of entertainment. But if you focus on the toy market, things are great. We’re releasing a lot of amazing things this year. 20. What are your future ambitions? We want to be a hub to connect people. A hub for artists and fans, a hub for distributors and creators. A hub for creations.